The Airbus A320 was approaching Heathrow when the incident happened. 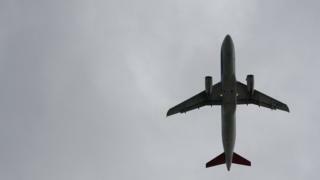 A near-miss involving a passenger jet and more than one drone has been reported in the UK for the first time. The incident happened over east London as an Airbus A320 was approaching Heathrow Airport last November. A report by the UK Airprox Board (UKAB) found the incident had “compromised the safety of the aircraft”. One pilot also said there would have been a “significant risk of collision” if the jet had been on a different approach path. The plane was flying at 5,500ft on 20 November when its crew spotted two white, orb-shaped drones nearby. The pilots “remained in constant visual contact” with the gadgets, which are estimated to have got as close as 500m to the aircraft, according to the report. Less than 30 minutes later, a Boeing 777 approaching Heathrow flew within 50m of what is believed to have been one of the drones, described as white, about 2m wide and with four prongs. A report was made to the Metropolitan Police, but the people flying the drones were not found. The latest report from UKAB said there had been five near-misses between aircraft and drones in one month – bringing the total over the past year to 62. This included one on the approach to Edinburgh Airport on 25 November, where the drone came within 75ft of the plane. A collision between the Airbus A319 and the drone was “avoided only by providence”, according to the report, which described it as a category A incident. But the Civil Aviation Authority (CAA) said the 20 November case was the first time there had been an incident involving more than one drone. According to CAA rules, drones must not be flown above 400ft or near airports or airfields. Earlier this month, police forces in the UK said they were being “flooded” with reports involving drones. Last year, more than 3,456 incidents involving drones were recorded, compared with only 1,237 in 2015, according to the PA news agency. Incidents involved include invasions of privacy, disputes between neighbours, and prison smuggling.